Honkaku Shochu and Awamori are some of the most intriguing spirits in the world, and yet they’ve largely remained hidden gems thanks to their limited availability outside of Japan, botched branding, and cheap knock-offs. The tides are changing though, and to help you enjoy this novel spirit, I’ve put together a little guide. Long before Washoku (traditional Japanese food) became a UNESCO Intangible Cultural Heritage, Japanese food culture has been making inroads into the hearts and bellies of foodies around the world. Whether it was teppanyaki in the 80’s, sushi in the 90’s, or ramen in the 00’s, the world’s understanding of Japanese food has developed, and with it, so has its appreciation of Japan’s beverage culture. Sake is perhaps the best known Japanese beverage brewed from rice. It’s been so successful that’s it’s transcended genre boundaries, finding itself on lists in fine French and Spanish restaurants. On the spirit side, Japanese whiskey has become an unexpected darling of whiskey connoisseurs, dominating several categories in the World Whiskies Awards. But what about Japan’s native spirits: Shochu and Awamori? Shochu is a traditional Japanese spirit made using a distillation process that came to Japan over 500 years ago. It can be made with dozens of base ingredients, including rice, but unlike sake, shochu is distilled after being brewed. Before I get into the details of how it’s made, there are a few terms I want to clear up. Honkaku Shochu (本格焼酎) literally means “genuine shochu.” With that bit of knowledge, I’m guessing you’re wondering what “fake shochu” is. There’s a whole other class of shochu called Korui Shochu (甲類焼酎) that are made on a continuous still. This industrial process produces a clear, odorless distillate that’s 95% ethanol. This is then watered down and may be mixed with sweeteners and flavorings to create the final product. The result is cheap booze that can be mass produced. Honkaku Shochu, on the other hand, is produced in small batches on a classic pot still. Since it only gets distilled one time, the flavors of the main ingredient are preserved, giving each type of shochu a unique character. Only shochu produced in this traditional manner can be labeled Honkaku Shochu (本格焼酎), so it’s a good idea to keep a screenshot of these characters the next time you’re out shopping for shochu. Now that that’s cleared up, please assume that I mean Honkaku Shochu when I say “shochu” from this point forward. Before we move on, there’s another point of confusion I want to clear up. If you spent your college years near a large Asian community, you’ve probably had some experience Korean soju, and if you graduated in the 90’s, you might have even had Japanese shochu. That’s because shochu was intentionally mislabeled “soju” for a stretch at the end of the last century (this is a long, complicated story involving US liquor laws and branding). Despite sharing similar names, and coming from the same region of the world, the two are made using vastly different processes. Nearly all modern soju is made on a continuous still, producing a flavorless high-proof spirit, which is then flavored, sweetened, and diluted to 17-25% Alcohol By Volume (ABV). That’s not to say soju is inferior in any way as I love a bottle(or two or three) of soju with spicy Korean food, but I just want to make it clear that we’re talking about two different products. There’s one last thing that I want to explain. Earlier in the post, I talked about Honkaku Shochu and Awamori, so what is awamori and how is it different from Shochu. Awamori is a distilled spirit that was developed in Okinawa thanks to the introduction of distillation technology from the Siam Kingdom (now known as Thailand) in the 15th century. It is thought to be one of the predecessors to modern day shochu and is still produced in Okinawa using the traditional method. The main difference with shochu is that awamori is always made using long-grain Indica rice as opposed to the short-grain Japonica rice that’s often used in the production of shochu. Awamori also relies exclusively on black koji to convert the starches in the rice into sugar. Finally, awamori only undergoes a one-stage fermentation as opposed to shochu, which undergoes a two-stage fermentation. So how is this storied spirit made? Perhaps the easiest way to explain the process is with this illustration. The brown path is for shochu, and the blue path is for awamori. 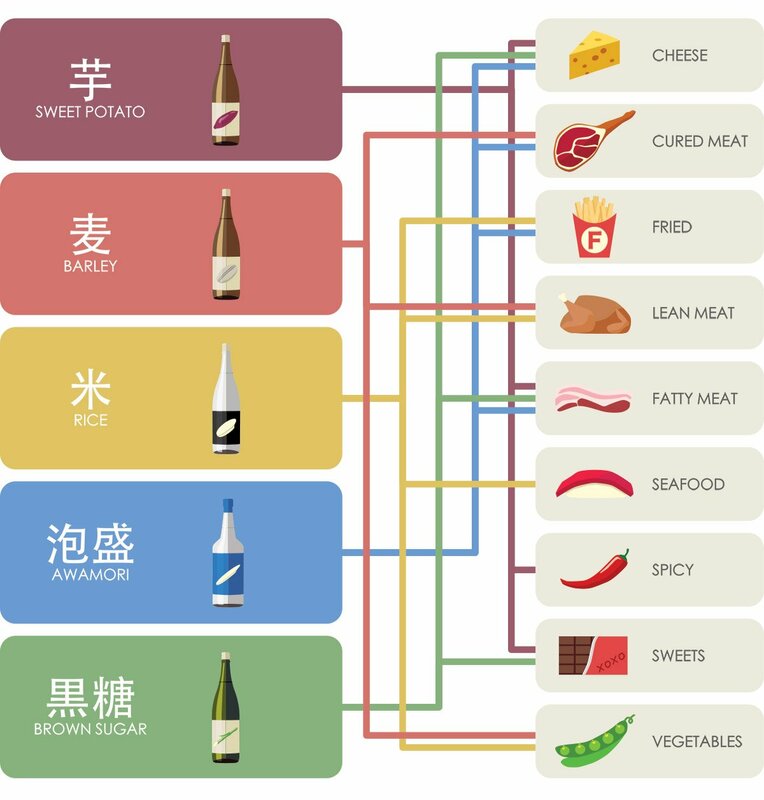 Because shochu is made using a two-stage fermentation, defining the ingredients is a little complicated as different ingredients can be introduced at each stage. At a high level, the primary moromi (mash) is made with water, koji, and yeast while the main ingredient (such as sweet potato, rice, barley, brown sugar, etc.) is added to the secondary moromi. It’s this main ingredient that defines the type of shochu that’s produced, and the difference can be as stark as rum and tequila. Although the main ingredient gets most of the credit, koji can be propagated on many different foods, which makes things a bit fuzzy. Koji is a filamentous fungus (a.k.a. mold) of the genus Aspergillus that turns ordinary soybeans and rice into everything from soy sauce to miso to sake. Its ubiquitous presence in Japanese cuisine gives it an almost mythical status and its feats seem almost magical. Koji’s superpowers include the ability convert starches into sugar, it produces enzymes that can tenderize meat, and it can even increase the amount of umami-producing amino acids in food. The first superpower is what makes the production of shochu possible. Yeast needs sugar to do its thing and produce alcohol. When combined with water and yeast, the koji starts to saccharify the starches in rice turning them into sugar, which the yeast readily consumes, emitting ethanol and carbon dioxide. Although koji is typically propagated on rice for culinary uses, for shochu, it can be propagated on barley or even sweet potatoes. Add to that the different species of koji, like white koji, yellow koji, and black koji and you have hundreds of potential combinations. As anyone who brews beer will tell you, the strain of yeast can also have a significant impact on flavor and then, of course, there are the various production methods of making shochu. Together these make for an almost infinite number of flavor profiles for shochu. Shochu is made using classic pot-still where the moromi is added to one side and heated. The heat causes the alcohol to evaporate, and the vapor produced passes through a condenser, which cools it down, returning it to its liquid state. This process leaves behind water and lees, producing a clear shochu that’s about 35-60% ABV. Shochu that comes straight off the still is known as genshu (原酒) and is usually diluted with water to around 25% ABV before being sold. To qualify as Honkaku Shochu it can only undergo one distillation, but there are some variations in the process. One relatively modern innovation involves drawing a vacuum in the still. This process is called genatsu (減圧), and it lowers the boiling temperature of the moromi, allowing the still to operate at a significantly lower temperature. Because delicate aromatic compounds are altered or destroyed with heat, this method preserves more nuances in the finished product. Sweet Potato (芋 – imo) – Swee potato shochu is one of the most classic varieties. Originating from the southern island of Kyushu where sweet potatoes are plentiful, sweet potato shochu has the most distinct aroma. People tend to either love or hate it, and the flavor is typically sweet and earthy, while it can also have a smoky, fruity, or floral aroma depending on how it’s made. Most sweet potato shochu uses rice koji in the primary moromi. However, some distilleries are now using sweet potato koji which makes these products 100% sweet potato. Barley (麦 – mugi) – Barley shochu has enjoyed some popularity in recent years due to its relatively neutral taste. It can be grassy and earthy with a clean finish that’s great for cleansing your palate between bites of food. 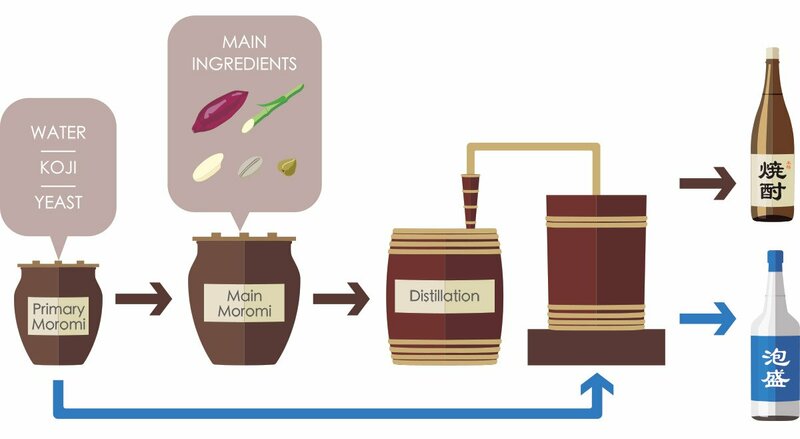 The koji in the primary moromi can either be rice-based or barley-based, and because of the vast production area of this grain, distilleries producing mugi shochu can be found all over Japan. Yakimugi (焼麦) shochu is a sub-type where the barley has been roasted first, giving the finished beverage a marvelous nutty flavor. Rice (米 – komé) – Although Kyushu is best known for their sweet potato shochu, the region along the Kuma river in Kumamoto prefecture produces rice-based shochu. Many rice producing areas around Japan also produce rice shochu. Sake breweries have also been producing rice shochu using the rice that’s been milled off each grain as part of the production of sake. Like its barley counterpart, rice shochu is relatively mellow, but it has a sweet, nutty flavor that’s reminiscent of a steaming bowl of freshly harvested rice. Brown Sugar (黒糖 – kokutou) – Brown sugar shochu is produced on the Amami islands between Kyushu and Okinawa using unrefined brown sugar as the main ingredient. This gives it a flavor similar to rum. Unlike rum, however, brown sugar shochu starts off with rice koji in the primary moromi before the brown sugar gets added to the main moromi. Others – Because koji is used to saccharify starches in the production of shochu, it’s made from hundreds of base ingredients. I’ve seen this run the gamut from buckwheat and chestnuts to milk and sesame seeds. Each one has its unique flavor, and yet they all adhere to the traditional two-stage fermentation and single distillation process that’s the hallmark of real shochu. Because of its relatively low ABV, shochu is very versatile in the number of ways you can enjoy it. While shochu can be sipped straight, it’s usually enjoyed with food, which is why it’s cut with another liquid like hot water or soda. Straight (ストレイト – sutoreito) – Unlike most spirits, shochu is mild enough that it can be enjoyed straight, at room temperature. Shochu is not a spirit meant for shots, so pour a little into a medium-sized glass and enjoy each sip. Cold water (水割り – mizuwari) – Shochu can be cut with water to dilute the alcohol content and make it milder. When pairing with food, this is a great way to bring the ABV down to the level of sake or wine while still allowing you to savor the flavor of the shochu. Hot water (お湯割り – oyuwari) – Cutting shochu with hot water warms it up, making it more fragrant. It’s a great way to keep you toasty during winter, and because the hot water vaporized the volatile aromatic compounds, it makes the shochu far more fragrant. Rocks (ロック – rokku) – Serving shochu on the rocks chills the shochu while slightly diluting it, giving it a smooth taste. This is my favorite way of enjoying high-quality shochu. Soda (ソーダ割り – sōdawari) – Serving shochu with a splash of soda water is a refreshing way to enjoy shochu, especially in summer. Tea (お茶割り – ochawari) – Mixing shochu with tea, such as oolong or roasted barley tea is a flavorful way to enjoy it, especially if you’re drinking a more neutral type of shochu. Juice – Shochu mixed with fresh fruit juices makes for a light, refreshing cocktail that’s perfect for those looking for a milder drink. Sweet Potato shochu is sweet and intensely fragrant and can exhibit flavors from smoke to roses to dried fruit. It pairs well with fermented or cured products like cheese and ham but also works surprisingly well with sweets like chocolate. Barley shochu has a relatively neutral flavor, accented by nutty or sometimes grassy notes. It’s a great palate cleanser, but it pairs well with more delicate foods such as chicken and root vegetables. Rice shochu one of the most mellow varieties, with a sweet aftertaste. It pairs well with foods with delicate flavors such as seafood, rice dishes, and cream sauces. Although awamori is produced with rice, its distinct production process gives it a more robust flavor than rice shochu. It pairs well with fried foods and fatty meats, such as pork belly. Brown sugar shochu is produced from sugarcane, so it’s not surprising that it tastes a bit like rum. This makes it a great pairing with gamey meats such as pork and lamb, but it also pairs well with desserts.